For Primrose Mutsigiri, the reigning Miss Malaika UK, meeting popular musician, Tuface Idibia two years ago in London was not a coincidence but divine. According to the queen from Zimbabwe, who is currently in Nigeria to work on her pet project, she and Tuface share the same vision and mission to assist the less privileged in the society. In this rare encounter with Blockbuster, Primrose opens up on her pet project, influence, dream of becoming the next Miss World and what exactly she wants from Tuface. Enjoy. “My name is Primrose Mutsigiri from Zimbabwe. I have been in beauty pageant since I could walk. I won my first beauty competition at the age of 17 when I was crowned Miss Zimbabwe UK in 2005. I followed it up with Miss Southern Africa UK, in 2006, Miss Africa UK 2006/07. I am the reigning Miss Malaika UK 2008. I arrived Nigeria on December 17, 2008. The people are warn and homely. I am in the country to work with a long-time friend, Tuface. We have been friends before I was crowned Miss Malaika UK. We met in England sometimes in 2006 or thereabout. We have the same vision and mission to assist the under-privileged. I came here so that we could both use our God-given talents to help the less privileged in the society. That is the purpose of the big foundation we are planning. It is in the works now. We plan to carry the foundation across, working with other acts in the continent. 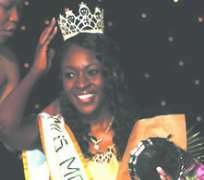 My reign as Miss Malaika UK ends in October 2009. But this has given me the platform. After my reign, I will certainly continue with the project. The reign might be over, but the project would continue. That is our collective determination. The project would not be in any way abandoned. The project would start in Nigeria because I want to build the castle on a solid rock. I will be working with a good friend (Tuface) to help the down trodden. I left Zimbabwe in 2000 when I was 12 years old. I moved to Ghana to stay with my aunt for three years. After that, I moved with my aunt, who re-locate d to England. That is where I have been since then. I really enjoyed my stay in Ghana. It made me to experience another African country. I had to move because my aunt moved. I attended University of Derby's Business School in England where I studied Marketing, Human Resources Management and Business Psychology. I like learning about new countries, new cultures and moving around. My family and friends supported what I was doing from the start. There was no opposition. It has been lots of encouragement and support all the way. They have been very understanding and supportive. I liked watching Miss World competitions. I used to put myself in the position. And I wished my dreams become a reality. I wished that in the near future I will become a Miss World. And that is my plan. I will want to have a shot at Miss World after my reign as Miss Malaika UK. Yeah! Actually, I want to keep my private life private. The political situation in my country, Zimbabwe is not conducive for the kind of project Tuface and I are working on. It saddens we wherever I hear all these crises in my country. I do believe that things are going to change for better. You can never know what exactly is the situation there. You can't say what actually is taking place in Zimbabwe. It is very sad, but there is hope. I have not experienced crime in Nigeria. Truly, there is a bit of crime and rowdiness. But I enjoy the warm hospitability of the people of Nigeria. I feel at home here. I strongly believe that God will use me as a vessel the way He uses Tuface. So, I have my absolute trust in Him. It is not by coincidence that Tuface and I know each other. It is also not by coincidence that we share the same vision. It is divine.